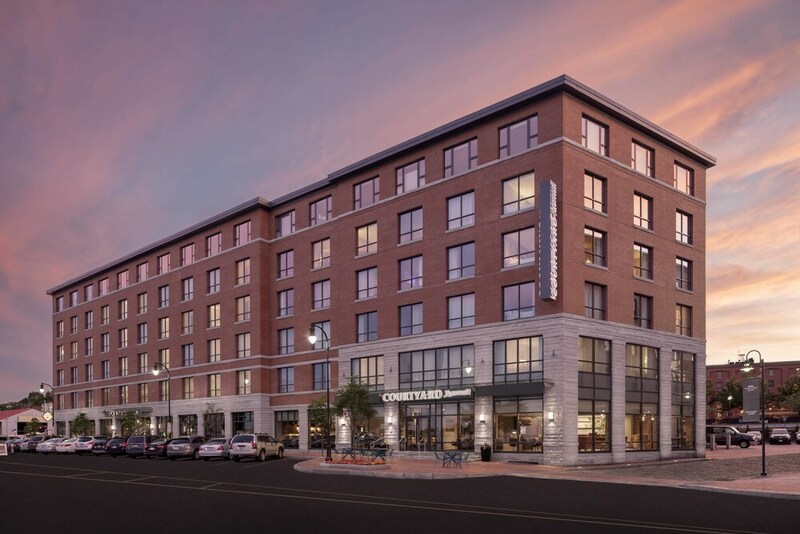 With a stay at Courtyard Portland Downtown/Waterfront, you'll be centrally located in Portland, a 2-minute drive from Cross Insurance Arena and 9 minutes from Maine Mall. This hotel is 7.8 mi (12.5 km) from Higgins Beach and 19.1 mi (30.8 km) from Old Orchard Beach Pier. Make yourself at home in one of the 127 air-conditioned rooms featuring refrigerators and flat-screen televisions. Complimentary wired and wireless Internet access keeps you connected, and cable programming provides entertainment. Private bathrooms with shower/tub combinations feature complimentary toiletries and hair dryers. Conveniences include desks and coffee/tea makers, as well as phones with free local calls. Enjoy a range of recreational amenities, including an indoor pool, a spa tub, and a 24-hour fitness center. Getting to nearby attractions is a breeze with the complimentary area shuttle. In addition to an indoor pool, Courtyard Portland Downtown/Waterfront provides a spa tub and a 24-hour fitness center. The hotel offers a restaurant, a coffee shop/café, and a snack bar/deli. A bar/lounge is on site where guests can unwind with a drink. Wired and wireless Internet access is complimentary. This 3-star property offers access to a business center. This business-friendly hotel also offers complimentary newspapers in the lobby, laundry facilities, and dry cleaning/laundry services. A roundtrip airport shuttle and an area shuttle are complimentary for guests. Onsite parking is available (surcharge), along with a car charging station. Courtyard Portland Downtown/Waterfront has designated areas for smoking. The Bistro - This restaurant serves breakfast and dinner. Guests can enjoy drinks at the bar.